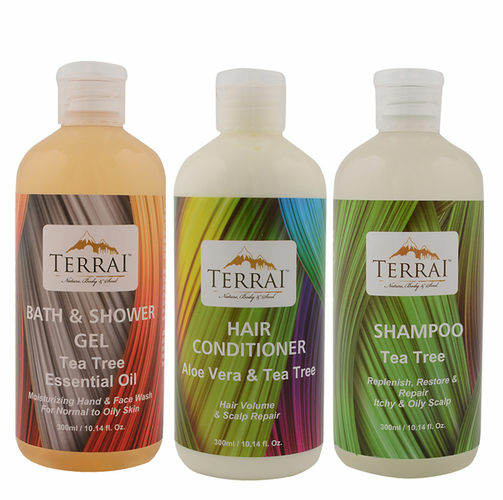 Terrai Tea Tree Oil Shampoo is rich and luxurious made without harsh chemicals, animal ingredients or animal testing. Its mild and natural formula, containing Natural Tea Tree Essential Oil, works to treat and repair dandruff causing oily scalp, while the product gently cleanses the hair to replenish the adequate moisture and restore good health. Your hair is left gentle, full-bodied and nourished, just as nature intended. Terrai Tea Tree Bath Gel, with all natural foaming action, contains the goodness of Aloe Vera and essential oil of Tea Tree, blended to cleans and take away excess oil, without stripping the skin of its natural protective moisture. It's an effective pore cleanser that washes with care and leaves you feeling refreshed and revitalized. All Terrai Hair Conditioners are formulated using the latest generation of plant-based ingredients and natural oils to soften the hair and give it body and shine. This delightful Aloe Vera & Tea Tree Hair Conditioner contains Tea Tree Oil along with other natural ingredients that act on the scalp and hair to provide natural protection against damage due to dryness and gives volume to the hair.